The operating system of a Keenetic router is modular, which allows you to install only those components that you need, thus freeing your Keenetic from unnecessary stress. The functionality of the router is determined by the set of installed components. You can always change this set by selecting the right components. You are limited in your choice only by the amount of memory in your Keenetic. NOTE: Important! To change the component set, the router must be connected to the Internet. Changing the component set will update KeeneticOS to the latest version. Any update to the router's operating system will cumulatively update all it's components. Rebuilding KeeneticOS is necessary even if you add or remove a single system component. 1. Go to the 'System settings' page. To add or remove components, press 'Component options'. 2. You can select the version of KeeneticOS in the router. You can install an official release (version with index C0, C1, etc. ), or a pre-release of the operating system, i.e. a beta version (with index B0, B1, etc.). For more information on the beta version of KeeneticOS, please refer to the instruction 'Installing a beta version of KeeneticOS'. 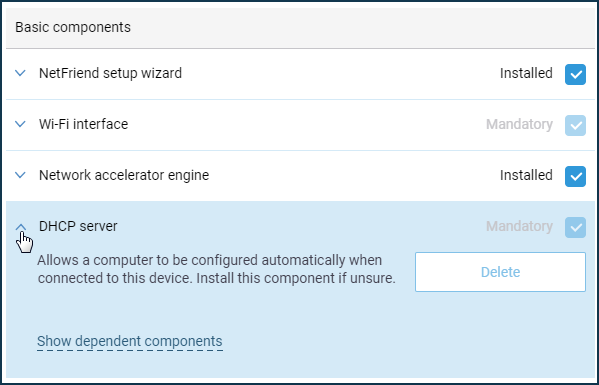 Once you've decided which upgrade you want to install (release or beta), proceed to select the components you need. In the 'Component List' section, tick the necessary components and untick the unnecessary ones. NOTE: Important! If a component is required for other components to work, its check box will be shaded. This also applies to mandatory components that cannot be removed. If a component is installed by default, but you do not know what it is responsible for, do not remove it. 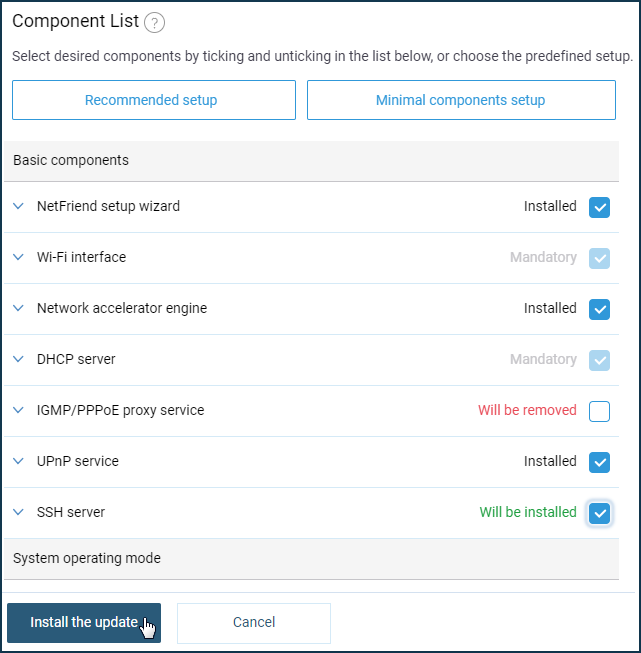 The ability to install all components available for a particular model at the same time, as well as their specific combinations, is not guaranteed. To find out what a particular component is responsible for (to see brief description), click on its name. 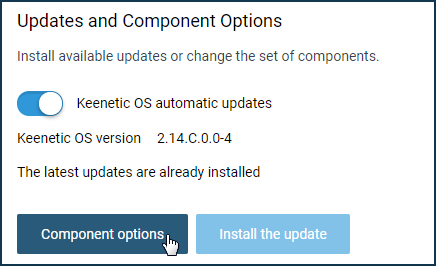 After selecting the required components, click 'Install the update'. 3. After that, the process of downloading and installing the components to the router will begin. NOTE: Important! During the update process, do not turn your Keenetic off or disconnect it from the Internet. After the update is installed, the router will restart automatically and then it will be ready for use again. To access the web interface, refresh the page in your web browser.